YES! 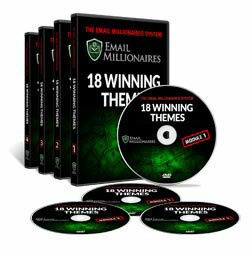 I want instant access to the complete Email Millionaires System so I can discover the copywriting secrets of the Internet Marketing elite. 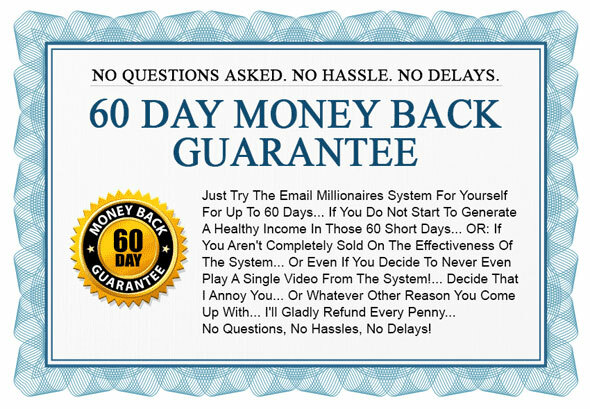 I know that with the Email Millionaires System's 60 Day Money Back Guarantee I take absolutely no risk. If I don't see the results I want or if I'm not making the money I expected, I will get a complete refund, NO HASSLES, NO QUESTIONS! If you miss the tone or don't bring out the perfect emotion in your prospect - your email will get trashed. Yet...with the right tone and emotion your prospect will feel so compelled to take action that the sale is as good as closed. There are 18 proven email themes that Anthony chooses from every time he writes an email. In this module you'll discover how to select the perfect Theme and then have a full blueprint to follow to execute the Theme and compel action from your prospect. Writing great teaser copy is essential if you want your email to ever even get opened. Yup...your emails "subject" is teaser copy. But it's not the only piece of Teaser Copy in your email. You'll have Teaser Copy sprinkled throughout the entire email. And the Teaser Copy's job is to keep your prospect glued to the email by teasing THE BENEFIT they are looking for. Your email will generally close with your Call-To-Action (which we'll talk more about in a minute) which is where you promise your prospect the answers to everything you have been teasing. The beauty of teaser copy is that there is a simple (yet fairly unknown) formula to writing the most compelling Teaser Copy possible. And this formula is exactly what you learn in this module. The Body Copy in your email is the meat and potatoes. It's the bulk of the actual email. And it's the hardest piece to get perfect. This is where most emails fail and why so many emails produce no results. You see, in order to get your prospect to take action they have to make it to the bottom of your email. And for them to do this they have to read your email. I say "read" your email, yet with the techniques you'll discover in this module, your prospect won't even feel like they're reading. They'll just slide down the page being sucked into whatever you tell them. Believability in an email is what builds a bond between you and your prospect. If they don't believe what your telling them or that you want the best for them, they will never give you a cent. The last thing you want is to come across as a sleazy salesman who will say and do anything to make a buck. So you have to have Believability elements throughout every email. These will make your prospect see you as their hero instead of their nemesis. This is one of Anthony's biggest strengths. He is the master of building a bond with the prospect no matter what market or demographic he's writing to. 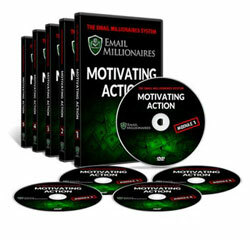 In this module he'll show you exactly how he does it...and gives you the power to do it too! This module is all about giving your emails the maximum Power possible, to keep readers flying through your emails all the while creating an intense buying desire. To make this happen your emails must have intense momentum. From the moment a prospect's eyes first spot your subject line ... click ... and then begin reading your email ... they're literally seconds away from another distraction, boredom and ultimately trashing your email. That's why master copywriters understand that the copy must feel energized - like it's going somewhere FAST - or else the prospect will get bored, distracted and soon will be history. In this module you'll unlock the principles the top copywriters rely on to keep their copy moving fast and powerfully. Far too often emails are just kind of "thrown together" without an overall strategy. You'll recall that the first module is all about selecting a theme. In this module you'll learn Anthony's proven strategy for tying all the components of your email back into the original theme. This way your teaser copy complements your body copy which feeds into your call to action and so on. Every aspect of your email will be connected and will logically flow and connect to the next piece. This gives your prospect the feeling that you are not only an expert in your field, but also that your email will take them right where they NEED to be. In the final module you'll learn the critical skill of the Call-To-Action. This is it...this is what everything you've done is leading up to. And it's ultimately what will decide if your email is a success or failure. You have teased your prospect, brought out a strong emotion, and sent them down a slide of compelling copy. Now you have to make sure they click and take action. As important as this step is...it's actually a very simple technique that alone will boost your Click-Through-Rate. 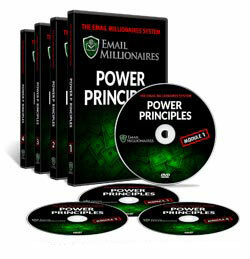 Yet, when used in tow with all the techniques you've already unleashed...this is when you open up the floodgates to becoming a true Email Millionaire. 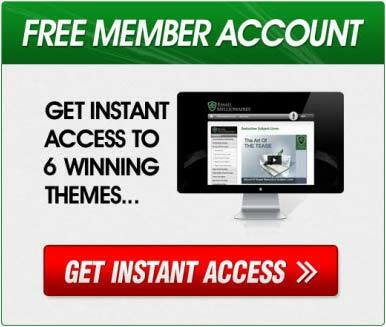 fill in your information, and you'll receive instant access to the Email Millionaires System. 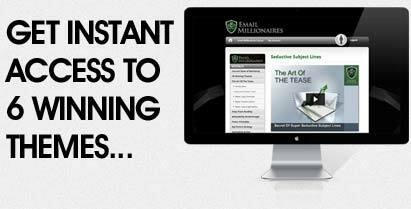 If you have any questions about the Email Millionaires System please send them to our support team at here Contact Us and we will get you an answer to any question you may have.